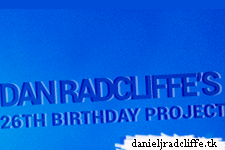 Daniel is going to be 26 this year on 23rd July 2015 and danieljradcliffe.tk has joined Glowing Radcliffe, Portal Radcliffe, danielradcliffe.de and Daniel Radcliffe Brasil to create a new Birthday Project this year in which fans from all over the world can participate. It's a bit like the Project from back in 2012. The video will include fans singing a Happy Birthday song -in their own language, as it's known in their own country-. The second part of the video will be a message to Daniel shown as fans holding up A4 sheets with the words. What's new this year is a Tumblr page (happybdayradcliffe.tumblr.com) which will feature photos from the project. The video and Tumblr link wil be send to Dan's team just as we did in 2012. It was even shared by The Trevor Project on Facebook! Want to join? Here are the rules for the photo. A note: Children must have approval from their parents. - We recommend a size between A3 and A4. The larger, the better. Please only use the word you will get assigned for the message. - The photo should be horizontal. - Do not edit before sending. As for the video: Please make sure that the audio is clear and that no external noises are inbetween. You have until 4th July 2015 12th July 2015 to join and correct the photo if needed. Please send your Name, Age, Country/City to dradcliffebproject2015@gmail.com. Don't forget to mention if you want your photo to appear on the Tumblr blog or not. If you still have questions, feel free to ask via social media or comments below. And please spread the word. What means "fans posing with signs"? Thanks! It means you hold the A4 paper with the assigned word for the photo ;) I'll look for a better description and change the text.